Dopamine D2 receptor antagonists modulate gene transcription in the striatum. However, the molecular mechanism underlying this effect remains elusive. Here we used the expression of Nur77, a transcription factor of the orphan nuclear receptor family, as readout to explore the role of dopamine, glutamate, and adenosine receptors in the effect of a dopamine D2 antagonist in the striatum. First, we investigated D2 antagonist-induced Nur77 mRNA in D2L receptor knockout mice. Surprisingly, deletion of the D2L receptor isoform did not reduce eticlopride-induced upregulation of Nur77 mRNA levels in the striatum. Next, we tested if an ibotenic acid-induced cortical lesion could block the effect of eticlopride on Nur77 expression. Cortical lesions strongly reduced eticlopride-induced striatal upregulation of Nur77 mRNA. Then, we investigated if glutamatergic neurotransmission could modulate eticlopride-induced Nur77 expression. A combination of a metabotropic glutamate type 5 (mGlu5) and adenosine A2A receptor antagonists abolished eticlopride-induced upregulation of Nur77 mRNA levels in the striatum. Direct modulation of Nur77 expression by striatal glutamate and adenosine receptors was confirmed using corticostriatal organotypic cultures. Taken together, these results indicate that blockade of postsynaptic D2 receptors is not sufficient to trigger striatal transcriptional activity and that interaction with corticostriatal presynaptic D2 receptors and subsequent activation of postsynaptic glutamate and adenosine receptors in the striatum is required. Thus, these results uncover an unappreciated role of presynaptic D2 heteroreceptors and support a prominent role of glutamate in the effect of D2 antagonists. Dopamine antagonists have been used to alleviate schizophrenia symptoms for more than a half-century. There is a general agreement that in vitro binding affinity for dopamine D2 receptors predicts efficacy and likelihood of causing extrapyramidal side effects of antipsychotic drugs (Miyamoto et al., 2005). However, although all antipsychotic drugs used in clinic share the similar pharmacological profile of being D2 antagonists (with the exception of aripiprazole, which is a partial D2 agonist), the exact molecular and cellular mechanisms that convey their therapeutic and undesired effects remain elusive. A growing body of evidence indicate that drugs targeting other neurotransmitters, such as glutamate and adenosine, might also display antipsychotic activity (Lara et al., 2006; Conn et al., 2009; Krystal et al., 2010). But, because of the in vivo reciprocal functional relationships between dopamine, glutamate, and adenosine receptor activities, it is difficult to pin point the specific contribution of these different receptor subtypes. The striatum expresses high levels of dopamine D2 receptors and is considered as an important brain area where dopamine and glutamate inputs are integrated to modulate psychomotor responses. The main striatal inputs are excitatory glutamatergic terminals coming from the cortex and thalamus, and dopamine afferences from the substantia nigra/ventral tegmental area complex. In order to process information coming from these multiple sources, striatal cells express a large array of neurotransmitter receptor subtypes at their surface (Gerfen and Surmeier, 2011). Striatal cells express glutamate receptors and a functional interaction between the activity of dopamine D2 and metabotropic glutamate receptors has been described. For example, blockade of metabotropic glutamate type 5 (mGlu5) receptor reduces haloperidol (D2 antagonist)-induced catalepsy (Ossowska et al., 2001). In addition, an interaction between dopamine D2, adenosine A2A, and mGlu5 receptors has been demonstrated in the striatum (Ferré et al., 2002; Kachroo et al., 2005; Cabello et al., 2009). For example, mGlu5 receptor antagonist-induced locomotor activity was abolished in postnatal forebrain-specific conditional (Cre/loxP system) A2A receptor knockout mice (Kachroo et al., 2005). In addition, using combination of bimolecular fluorescence complementation and bioluminescence resonance energy transfer techniques, it has been shown that mGlu5, A2A, and D2 receptors can form oligomers in HEK293 cells (Cabello et al., 2009). High-resolution immunoelectron microscopy also indicated that the three receptors co-distribute within the extrasynaptic plasma membrane of the same dendritic spines of striatal synapses and co-immunoprecipitation experiments demonstrated the existence of an association of mGlu5, D2, and A2A receptors in rat striatal homogenates (Cabello et al., 2009). Another important contributing factor to the striatal activity is the presence of neurotransmitter receptors located on cortical inputs to the striatum that regulate glutamate release. Indeed, activation of presynaptic D2 heteroreceptors located on glutamate neuron terminals (Schwarcz et al., 1978; Wang and Pickel, 2002) modulates glutamate release within the striatum and represents an important regulator of striatal excitatory inputs (Maura et al., 1988; Cepeda et al., 2001; Bamford et al., 2004). Dopamine D2 receptors exist in two receptor isoforms derived from alternative splicing of the same gene (Giros et al., 1989). Accumulating evidence indicates that the D2 short (D2S) receptor isoform is mainly associated with presynaptic activities (Khan et al., 1998a; Usiello et al., 2000; Lindgren et al., 2003). Interestingly, it has been shown that dopaminergic modulation of corticostriatal glutamate release depended upon the D2S receptors (Centonze et al., 2004b). On the other hand, the D2 long (D2L) receptor isoform seems to mediate postsynaptic dopamine receptor functions (Khan et al., 1998a; Usiello et al., 2000; Lindgren et al., 2003). Modulation of gene transcription within neurons rapidly leads to protein synthesis and subsequent cellular adaptation. It is well documented that typical antipsychotic drugs rapidly induce genes like c-fos, Zif268, and Nur77 (NGFI-B, Nr4a1; Herrera and Robertson, 1996; Herdegen and Leah, 1998; Lévesque and Rouillard, 2007). Nur77 is a transcription factor of the nuclear receptor family that is rapidly induced after treatment with typical antipsychotic drugs (D2 antagonists; Beaudry et al., 2000; Maheux et al., 2005). Previous reports from our laboratory indicate that Nur77 is involved in gene expression as well as in abnormal motor behaviors following exposure to a typical antipsychotic drug (for a review see, Lévesque and Rouillard, 2007). For example, haloperidol-induced striatal neuropeptides enkephalin and neurotensin mRNA expression is strongly impaired in Nur77 knockout mice (Ethier et al., 2004a), while these mice display exacerbated haloperidol-induced vacuous chewing movements (similar to tardive dyskinesia; Ethier et al., 2004b). However, the exact contribution of glutamate, adenosine, and dopamine D2S and D2L receptors in the regulation of striatal gene expression remains to be clarified. In the present study, using Nur77 mRNA expression as readout, we show that D2 antagonist-induced transcriptional activity in the striatum is mediated by interaction of the drug with presynaptic D2S heteroreceptors located at corticostriatal terminals and subsequent activation of postsynaptic glutamate mGlu5 and adenosine A2A receptors. For pharmacological experiments, adult male wild type C57BL/6 mice (Charles River, St-Constant, QC, Canada) and mice lacking dopamine D2L receptors [D2L receptor knockouts, D2L(−/−)] and their littermates (Usiello et al., 2000) were used. All mice weighted 20–25 g and were housed five per cage in a temperature-controlled environment maintained under a 12-h light/dark cycle with ad libitum access to food and water. For experiments involving ibotenic acid lesions, we used male Sprague–Dawley rats (Charles River, St-Constant, QC, USA) weighing 280–320 g. Experimental procedures, including means to minimize discomfort, were reviewed and approved by the institutional Animal Ethics Committee of the Université de Montréal and were done in accordance with the Canadian Council on Animal Care guidelines for use of experimental animals. The selective dopamine D2/D3 receptor antagonist eticlopride, cannabinoid CB1 receptor antagonist 1-(2,4-dichlorophenyl)-5-(4-iodophenyl)-4-methyl-N-1-piperidinyl-1H-pyrazole-3-carboxamide (AM251), muscarinic antagonist scopolamine, and selective adenosine A2A antagonist SCH 58261 were purchased from Sigma–Aldrich (St. Louis, MO, USA). The selective mGlu5 antagonist 2-methyl-6-(phenylethynyl)pyridine hydrochloride (MPEP), mGlu1/5 agonist (RS)-3,5-Dihydroxyphenylglycine (DHPG), selective mGlu5 agonist (RS)-2-Chloro-5-hydroxyphenylglycine sodium salt (CHPG), selective A2A agonist 4-[2-[[6-Amino-9-(N-ethyl-β-D-ribofuranuronamidosyl)-9H-purin-2-yl]amino]ethyl]benzene propanoic acid hydrochloride (CGS 21680), and excitatory amino acid transporters 1-2 (EAAT1-2) blocker (3S)-3-[[3-[[4-(Trifluoromethyl)benzoyl] amino]phenyl]methoxy]-L-aspartic acid (TBOA) were purchased from Tocris Bioscience (Avonmouth, UK). Non-competitive NMDA antagonists phencyclidine (PCP) and MK-801 were obtained from Sigma–Aldrich through a restricted importation permit. PCP analogs N-[1-(2-benzo(β)thiophenyl)cyclohexyl]piperidine (BTCP) and N-[1-(2-thiophenyl)cyclohexyl]piperidine (TCP) were obtained as a gift from Dr. J. M. Kamenka and the National Institute of Mental Health Chemical Synthesis Program (Rouillard et al., 1990). First, we compared the effect of vehicle (NaCl 0.9%) and eticlopride (1 mg/kg) on striatal Nur77 mRNA expression in wild type [D2L(+ / +)] and D2L(−/−) mice in order to assess the contribution of D2S and D2L receptor isoforms in the effect of the D2 antagonist. We used eticlopride, a highly selective D2/D3 receptor antagonist, because typical antipsychotic drugs used in clinics display a wider pharmacological profile, which could further complicate data interpretation. Note that eticlopride displays activities similar to typical antipsychotic drugs, but it is not used in clinic because of its poor pharmacokinetic properties (Martelle and Nader, 2008). Secondly, we assessed the effect of glutamatergic drugs on Nur77 gene transcription. We acutely treated (0.25 ml, i.p.) five different groups of wild type mice (N = 5) as follows: (a) vehicle (NaCl 0.9%); (b) MK-801 (non-competitive NMDA receptor antagonist, 0.75 mg/kg); (c) PCP (5 mg/kg); (d) BTCP (16 mg/kg); and (e) TCP (0.75 mg/kg). Then, lower doses of MK-801 were used alone or in combination with eticlopride. Groups of mice were formed as follows: (a) vehicle (NaCl 0.9%; N = 6); (b) eticlopride (1 mg/kg; N = 5); (c) MK-801 (0.3 mg/kg; N = 5); (d) MK-801 (0.03 mg/kg; N = 5); (e) eticlopride (1 mg/kg) + MK-801 (0.3 mg/kg); (f) eticlopride (1 mg/kg) + MK-801 (0.03 mg/kg). MK-801 was injected 15 min before eticlopride. In the third experiment, involvement of mGlu5 and A2A receptor drugs on eticlopride-induced Nur77 upregulation was investigated. Animals were distributed into eight groups and treated as follows: (a) vehicles (NaCl 0.9 and 3% DMSO, 8% PEG600 in sterile water); (b) MPEP (mGlu5 antagonist, 10 mg/kg); (c) SCH58261 (A2A antagonist, 5 mg/kg); (d) MPEP + SCH58261; (e) eticlopride (dopamine D2 antagonist, 1 mg/kg); (f) eticlopride (1 mg/kg) + MPEP (10 mg/kg); (g) eticlopride (1 mg/kg) + SCH58261 (5 mg/kg); (h) eticlopride (1 mg/kg) + MPEP + SCH58261 (N = 5 per group). MPEP and SCH58261 were administered 30 min before the dopamine antagonist. A similar paradigm was used to investigate the effect of the CB1 antagonist AM251 (5 mg/kg, i.p.) and muscarinic m1-4 antagonist scopolamine (2.5 mg/kg, i.p.) on eticlopride-induced Nur77 expression. All the drug doses used were chosen based on previous studies using similar paradigms; eticlopride (Keefe and Adams, 1998; Pozzi et al., 2003; Bourhis et al., 2008), ionotropic glutamatergic drugs (Rouillard et al., 1990; Keefe and Adams, 1998; Chartoff et al., 1999), MPEP (Choe et al., 2002; Parelkar and Wang, 2004), SCH58261 (Pollack and Fink, 1995; Pinna et al., 1999), AM251 (Xi et al., 2006; Rubino et al., 2007), and scopolamine (Guo et al., 1992; Wang and McGinty, 1996). For all treatments, mice were sacrificed by decapitation 60 min after the last drug injection under CO2 anesthesia. Brains were rapidly removed, immediately immersed into cold 2-methylbutane (−40°C) for a few seconds and kept frozen at −80°C until used. Probe preparation and in situ hybridization of Nur77 mRNA on brain slices were performed as previously reported (Beaudry et al., 2000; St-Hilaire et al., 2003; Maheux et al., 2005). Briefly, the Nur77 single-stranded riboprobe was synthesized and labeled using Promega riboprobe kit (Promega, Madison, WI, USA), [35S]UTP (PerkinElmer Life and Analytical Sciences, Woodbridge, ON, Canada), and the RNA polymerase T3. In situ hybridization of the riboprobe with cryostat coronal brain sections (12 μm) mounted on Snowcoat X-tra slides (Surgipath, Winnipeg, MA, Canada) was done at 58°C overnight in a standard hybridization buffer containing 50% formamide. Brain sections were then apposed against BiomaxMR radioactive sensitive films (Eastman Kodak, New Haven, CT, USA) for 2 days. Levels of autoradiographic labeling on films were quantified by computerized densitometry as previously described (Beaudry et al., 2000; St-Hilaire et al., 2003; Maheux et al., 2005). Optical density of the autoradiograms was translated in nCi/g of tissue using [14C]-radioactivity standards (ARC 146A-14C standards, American Radiolabeled Chemicals Inc., St. Louis, MO, USA). Nur77 mRNA levels were measured in the dorsomedial (StDM), dorsolateral (StDL), ventromedial (StVM), and ventrolateral (StVL) portions of the striatum, and the nucleus accumbens shell (AcSh) and core (AcC). The average level of labeling for each area was calculated from three to four adjacent brain sections of the same animal. Background intensity was subtracted from every measurement. All data are expressed as group mean ± SEM and statistical analysis were performed using GraphPad Prism version 5.0 (GraphPad Software Inc., San Diego, CA, USA). Statistical comparisons between groups were obtained by using a one-way analysis of variance and a Bartlett’s test for equal variance. When the Bartlett’s test showed significant differences between variance, the log, or square root of data were used in the analysis. One-way analyses of variance were followed by a Tukey’s multiple comparison test as a post hoc test when appropriate. Brain sections were pre-incubated in a 50 mM Tris-HCl buffer, pH 7.4, containing 120 mM NaCl, 5 mM KCl, 1 mM CaCl2, 1 mM MgCl2, 5.7 mM ascorbic acid, and 10 μM hydroxyquinoline for 15 min. The slides were then incubated for 1 h a room temperature in the same buffer containing 0.2 nM [125I]iodosulpride (Martres et al., 1985). Non-specific binding was evaluated in the presence of 2 μM raclopride. After 2 min rinses in ice-cold buffer, sections were dipped for 10 s in cold water, dried, and apposed to BioMax film. Autoradiograms were generated after an exposure time of 24 h.
Rats were anesthetized with isoflurane (2.5–3.5%, O2 0.6 L/min) and mounted on a stereotaxic apparatus. The surface of cranium was exposed and the bone and dura above the left or right sensorimotor cortex was removed. A needle (300 μm in diameter) containing 5 μg/μl of ibotenic acid, or its vehicle, was inserted into the cortex at five anterior-posterior (0.5 mm apart) and 2–4 medial-lateral sites using the following flat skull coordinates: between 0.5 posterior and 1.5 mm anterior to Bregma; 1.4–3.3 mm lateral to the sagittal line, and 1.2–2.2 mm below the surface of the cortex. At each site, the needle was lowered to 2.2 mm below the cortex and a volume of 0.15 μl solution was injected over a minute; two (three for the most lateral and anterior sites) similar injections were made 0.5 and 1.0 mm above. The solution was injected using a microinfusion pump to activate a Hamilton microsyringe connected to the injection needle by polyethylene tubing. Similar saline injections were performed in sham animals. Ten days after surgery, animals were injected with eticlopride (1 mg/kg, i.p.) or saline and returned to their home cage. Sixty minutes after the injection, they were anesthetized with isoflurane (3.5%, O2 0.6 L/min) and killed by decapitation. The brains were quickly removed dipped in cold 2-methylbutane and stored at −80°C. Corticostriatal organotypic slice cultures were prepared from 4–5 days old mice using the methods of Stoppini et al. (1991) and Stahl et al. (2009) with minor modifications (Stoppini et al., 1991; Stahl et al., 2009). Briefly, mouse brains were extracted and immerged in complete Hank’s buffer solution supplemented with glucose (5.6 mM) and sucrose (27.8 mM). Coronal 400 μm slices were cut using a McIlwain tissue chopper (Havard Apparatus, St. Laurent, QC, USA). Slices containing the striatum were transferred on Millicell filter inserts (0.4 μm; Millipore, Fisher scientific, Whitby, ON, USA) placed into a six-well plate filled with 1 ml of neurobasal medium containing 10% FBS, 1× N-2 supplement, 1× glutamine, 1× antibio-antimyc, and 0.6% glucose and maintained in culture for 3 days. Slices were then serum deprived for 14 h before pharmacological treatments. Drugs such as TBOA, DHPG, CHPG, and CGS 21680 were applied for 1 h directly to the culture medium. MPEP or quinpirole were applied 15 min prior subsequent treatments. Striata were removed using a glass Pasteur pipette as a tissue punches. Striatal tissue samples were expelled directly in Trizol reagent for RNA extraction (Sigma–Aldrich, St. Louis, MO, USA). Reverse transcriptase reactions of 2 μg RNA were performed in a final volume of 20 μl using the High Capacity cDNA Reverse Transcription Kit with random primers (Applied Biosystems, Streetsville, ON, USA). Complementary DNA samples (1.5 μl) were used for SYBR green qPCR amplification of Nur77 (Nr4a1; NM_010444.2) using Fast SYBR Green Master Mix (Applied Biosystems, Streetsville, ON, USA). Gene expression level for endogenous controls was determined using pre-validated Taqman Gene Expression Assays (Applied Biosystems, Streetsville, ON, USA). Four endogenous controls [glyceraldehyde-3-phosphate (GAPDH), hypoxanthine guanine phosphoribosyl transferase (HPRT1), β-actin, ACTB, and TATA binding protein (TBP)] were first assessed to determine which ones had the more stable expression in our experimental conditions. Further analysis of each sample was controlled using both GAPDH (NM_008084.2) and HPRT1 (NM_013556). The ABI PRISM® 7900HT Sequence Detection System (Applied Biosystems, Streetsville, ON, USA) was used to detect amplification levels. All reactions were run in triplicate and average values of cycle thresholds (CTs) were used for quantification. The relative quantification of target genes was determined using the ∆∆CT method. We first investigated the contribution of D2S and D2L receptors in the modulation of Nur77 mRNA expression in the striatum by comparing basal and eticlopride-induced Nur77 mRNA levels in wild type (+/+) and D2L knockout (−/−) mice (Usiello et al., 2000; Lindgren et al., 2003). D2L(−/−) mice displayed a significant reduction in basal Nur77 mRNA levels in the dorsomedial striatum, but basal transcript levels were unchanged in all other striatal subterritories, as compared with their wild type littermates (Figure 1). As expected, administration of eticlopride in wild type mice led to a strong increase of Nur77 transcript levels (Figure 1). Surprisingly, this modulation was still present in D2L mutant mice (Figure 1), and was even significantly stronger when compared to their wild type littermates in most striatal subterritories (Figure 1). These data indicate that D2L receptors might not play an important role in the effect of eticlopride-induced Nur77 expression in the striatal tissue. Figure 1. Eticlopride induces Nur77 mRNA levels in D2L knockout mice. 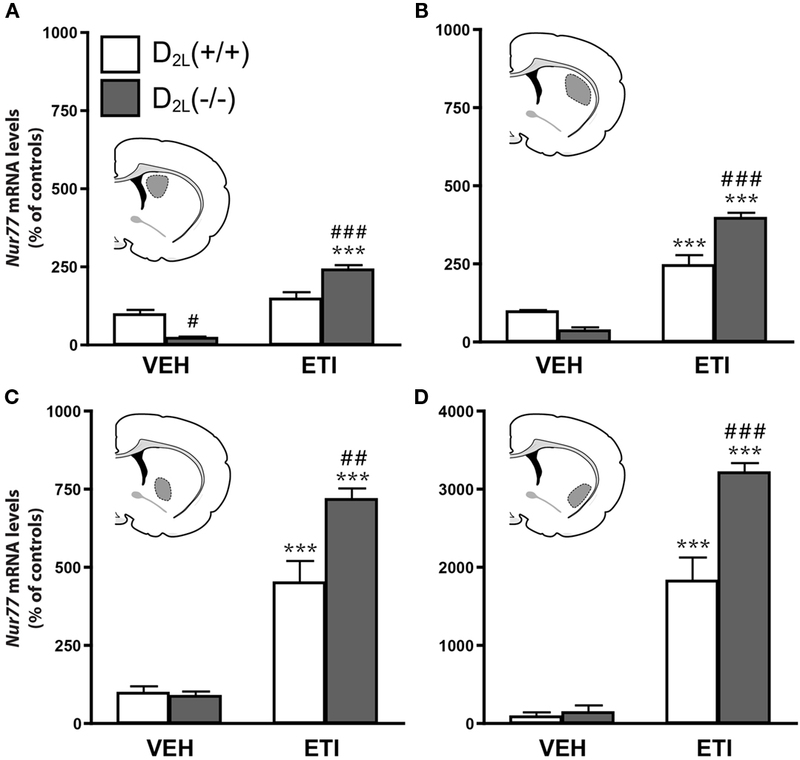 Nur77 mRNA levels (expressed as% of control) were measured in (A) dorsomedial (StDM), (B) dorsolateral (StDL), (C) ventromedial (StVM), (D) ventrolateral (StVL) portions of the striatum in dopamine D2 long receptor isoform knockout [D2L(−/−)] mice and their wild type littermates [D2L(+ / +)]. Histograms represent mean ± SEM (***p < 0.001 vs. vehicle (VEH) of the same strain, #p < 0.05 and ###p < 0.001 vs. eticlopride (ETI)-treated wild type [D2L(+ / +)] mice, N = 8 per group). Insets represent drawings of specific striatal areas (in gray) used for quantification. In order to investigate whether integrity of the corticostriatal pathway, and therefore involvement of presynaptic D2 heteroreceptors in eticlopride-induced Nur77 mRNA in the striatum, we proceeded to unilateral lesions of corticostriatal fibers using intra cortical injections of ibotenic acid. Ibotenic acid injections led to the lesion of most cortical neurons located in the primary motor cortex (M1) and affected all layers of the cortex. In some individuals, the lesion extended to the primary sensorimotor cortex (Figures 2A–C). Nissl staining (data not shown) and [125I] iodosulpride specific binding to dopamine D2 receptors showed that underlying subcortical regions were left intact (compared Figures 2B,C). As expected, eticlopride-induced a strong increase in Nur77 mRNA levels in control animals bearing a sham lesion (Figure 2D). On the other hand, unilateral cortical lesion almost totally prevented eticlopride-induced upregulation of Nur77 mRNA levels in the ipsilateral dorsal striatum (Figure 2D). Eticlopride-induced striatal Nur77 mRNA levels were comparable to sham-lesioned animals in the contralateral side (Figure 2D). These data clearly indicate that the integrity of corticostriatal inputs is necessary for the upregulation of Nur77 mRNA levels by the D2 antagonist in these striatal subterritories. Figure 2. Ibotenic acid lesions of the cortex prevent eticlopride-induced Nur77 mRNA levels. (A) Schematic representation showing the average extent of ibotenic acid lesions in the primary motor cortex (M1). The darker gray area represents the biggest lesions obtained, whereas lighter gray area shows the smallest ones. The shaded area indicates the region used for quantification of Nur77 mRNA levels in the striatum. Similar quantifications were performed in the unlesioned side (contralateral). (B) Representative autoradioagram of [125I]iodosulpride specific binding at dopamine D2 receptors on a coronal slice showing that the lesions remain circumscribed in the cortex. Dash lines depict the position of the corpus callosum identified on an adjacent section after Nissl staining (not shown). (C) Representative autoradiogram showing in situ hybridization of the Nur77 mRNA after eticlopride (ETI) administration. (D) Quantification of striatal Nur77 mRNA levels in the ipsilateral (IPSI) and contralateral (CONTRA) sides of the lesion in animals treated with saline or eticlopride (ETI) and bearing a sham or an ibotenic acid-induced lesion. Data are expressed in μCi/g of tissue. Histogram bars represent means ± SEM (N = 5, **p < 0.01 and ***p < 0.001 vs. same side control (Sham-Saline); ###p < 0.001 vs. IPSI side of Ibotenic-ETI group and ◊◊◊p < 0.001 vs. CONTRA side of Ibotenic-ETI group). We then investigated if glutamate receptors located on postsynaptic striatal medium spiny neurons might contribute to the effect of the D2 antagonist. To test this hypothesis, we combined the administration of eticlopride with ionotropic or metabotropic glutamate receptor antagonists. Although the modulation of Nur77 mRNA levels by dopamine D2 antagonists has been previously described (Beaudry et al., 2000; Werme et al., 2000; Maheux et al., 2005), modulation of this transcription factor by glutamate receptors remains largely unexplored. Thus, we first evaluated the effect of NMDA antagonists on striatal Nur77 mRNA levels in wild type mice. Both MK-801 (0.75 mg/kg) and PCP (5 mg/kg) strongly reduced basal Nur77 mRNA levels in the striatal complex (Figure 3). We also used two PCP analogs to confirm the role of NMDA receptors in the effect of PCP. TCP is a PCP analog, which display a stronger affinity for the PCP site on the NMDA receptor than PCP itself, whereas BTCP is a PCP analog characterized by a higher affinity for the dopamine transporter (Rouillard et al., 1990). A dose equivalent of BTCP produced a strong increase in Nur77 expression (Figure 3). This effect is consistent with the BTCP psychostimulant-like property, since it has been previously shown that psychostimulants increased Nur77 mRNA levels (Bäckman and Morales, 2002; Bhardwaj et al., 2003). A PCP dose equivalent of TCP based on their affinity for the PCP site did not induce Nur77 mRNA levels, but rather tended to reduce it (however, it did not reach significance). Thus, we may conclude from these experiments that basal striatal Nur77 expression is under a tonic control by NMDA receptors. Figure 3. NMDA antagonists reduced basal Nur77 expression. Levels of Nur77 mRNA (expressed as% of control) were measured in the ventrolateral portion of the striatum after treatment with vehicle (VEH), MK-801 (0.75 mg/kg, i.p. ), PCP (5 mg/kg, i.p. ), TCP (0.75 mg/kg, i.p. ), or BTCP (16 mg/kg, i.p.). Histograms represent mean ± SEM (**p < 0.01 vs. VEH, N = 5 per group). Inset: representative autoradiograms showing Nur77 mRNA levels in a left hemi-brain from the VEH group and a right hemi-brain from the PCP group. In the next step, we investigated the role of NMDA receptors into the upregulation of Nur77 mRNA expression induced by the D2 antagonist eticlopride. Since the initial dose of MK-801 (0.75 mg/kg) induced a strong reduction of basal Nur77 expression (Figure 3), which could be mixed up with the putative effect of NMDA on eticlopride-induced Nur77 expression, we investigated two lower doses of MK-801 (0.03 and 0.3 mg/kg) alone or in combination with eticlopride (Figures 4A–D). At these concentrations, MK-801 was still able to reduce basal Nur77 levels, but to a lesser extent (Figures 4A–D). 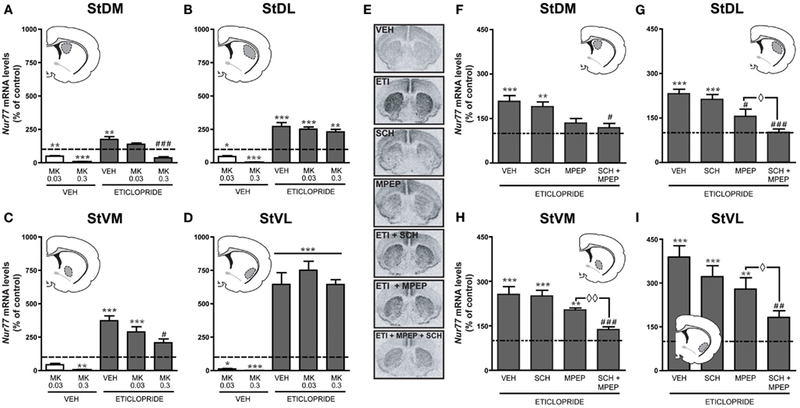 However, both MK-801 doses did not alter eticlopride-induced Nur77 expression in lateral striatal subterritories (Figures 4B,D) and the lower dose of MK-801 (0.03 mg/kg) also remained without effect in medial portions of the striatum (Figures 4A,C). Note that a similar low dose of MK-801 can modulate c-fos mRNA levels in the brainstem, as well as to reduce reward threshold induced by electrical self-stimulation of the ventral tegmental area (Hattori et al., 2004; Clements and Greenshaw, 2005), indicating that this dose is effective. Figure 4. Blockade of mGlu5 and A2A receptors abolishes eticlopride-induced upregulation of Nur77 mRNA expression. Modulation of basal and eticlopride-induced Nur77 mRNA levels by the NMDA antagonist MK-801 (0.03 or 0.3 mg/kg) was measured in (A) dorsomedial (StDM), (B) dorsolateral (StDL), (C) ventromedial (StVM), (D) ventrolateral (StVL) portions of the striatum. Insets represent drawings of specific striatal areas (in gray) used for quantifications. Basal Nur77 mRNA levels in respective striatal subterritories of untreated animals were set to 100% and are indicated as dash lines. Histograms represent mean ± SEM of animals treated with MK-801 (0.3 or 0.03 mg/kg) alone or eticlopride- and MK-801 (MK)-treated animals (*p < 0.05, **p < 0.01, and ***p < 0.001 vs. vehicle (VEH); #p < 0.05 and ###p < 0.001 vs. eticlopride, N = 5 per group). (E) Representative autoradiograms showing Nur77 mRNA levels following drug administrations. Inhibitions of eticlopride-induced Nur77 expression (expressed as% of control, dash lines) by the vehicle (VEH), SCH58261 (SCH), MPEP, or SCH + MPEP were measured in (F) dorsomedial (StDM), (G) dorsolateral (StDL), (H) ventromedial (StVM), (I) ventrolateral (StVL) portions of the striatum. Nur77 mRNA levels in animal treated with VEH, MPEP, SCH58261, or MPEP + SCH58261 alone can be found in Table 1. Histograms represent mean ± SEM of eticlopride-treated groups (**p < 0.01 and ***p < 0.001 vs. control; #p < 0.05, ##p < 0.01, and ###p < 0.001 vs. eticlopride alone (VEH); ⋄p < 0.05 and ⋄⋄p < 0.01 vs. MPEP + eticlopride, N = 5 per group). Since these results suggested a modest contribution of NMDA receptors in eticlopride-induced Nur77 mRNA levels in the striatum, we investigated the role of the metabotropic glutamate mGlu5 receptor and its partner, the adenosine A2A receptor (Figures 4E–I). Administration of MPEP (mGlu5 antagonist) or SCH58261 (A2A antagonist) alone had no effect on Nur77 mRNA expression in the brain areas analyzed (Table 1). When co-administered with eticlopride, SCH58261 had no significant effect on the upregulation of Nur77 mRNA expression (Figures 4E–I). Selective blockade of mGlu5 receptor with MPEP tended to reduce eticlopride-induced Nur77 mRNA levels, but this effect reached significance only in the dorsolateral portion of the striatum (Figure 4G). Interestingly, co-administration of both MPEP and SCH58261 strongly reduced eticlopride-induced Nur77 mRNA levels in all striatal subterritories, restoring Nur77 mRNA levels back to baseline (Figures 4E–I). Table 1. Nur77 mRNA levels following vehicle, MPEP, and SCH58261 in striatal subterritories. To complement the pharmacological characterization of the dopamine D2 receptor antagonist effect, we also investigated the contribution of cannabinoid and muscarinic drugs in the modulation of striatal Nur77 mRNA levels induced by eticlopride. Systemic injections of AM251, a CB1 receptor antagonist or scopolamine, a muscarinic m1-4 receptor antagonist, alone did not modulate Nur77 mRNA levels in the ventrolateral portion of the striatum (Figure 5). 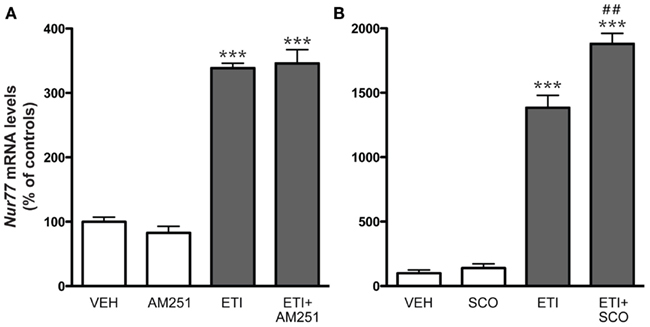 Co-administration of AM251 or scopolamine with the D2 antagonist did not reduce eticlopride-induced Nur77 expression in the ventrolateral portion of the striatum (Figure 5). In fact, scopolamine significantly further increased eticlopride-induced Nur77 expression (Figure 5). Figure 5. Cannabinoid and muscarinic receptor antagonists did not reduce eticlopride-induced Nur77 mRNA levels in the striatum. (A) Groups of mice were treated with, either saline 0.9% (VEH, N = 5), eticlopride (ETI, 1 mg/kg, N = 5), CB1 antagonist AM251 (5 mg/kg, N = 5), or a combination of ETI and AM251. (B) Groups of mice were treated with, either VEH (N = 5), ETI (1 mg/kg, N = 5), scopolamine (SCO, 2.5 mg/kg, N = 5), or a combination of SCO and ETI. AM251 and SCO were administered 15 min prior ETI. Histograms represent means ± SEM. 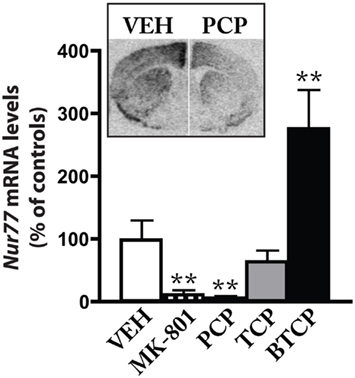 Nur77 mRNA levels are expressed in% of control (VEH) in the ventrolateral portion of the striatum (***p < 0.001 vs. VEH and ##p < 0.01 vs. ETI alone). Similar results were obtained in the other striatal subterritories (data not shown). To directly demonstrate the contribution of mGlu5 and adenosine A2A receptor subtypes to the modulation of Nur77 mRNA expression, we tested whether an increase of glutamatergic neurotransmission or mGlu5 and A2A receptor activation can modulate Nur77 mRNA levels in corticostriatal organotypic slices in culture. To this end, we used TBOA, which is a high affinity blocker of glial excitatory amino acid transporters 1 and 2 (EAAT1-2), which has been shown to increase glutamate concentration in acute slice preparations (Beurrier et al., 2009). TBOA alone produced a nice and strong dose-dependent Nur77 mRNA induction (Figure 6A). 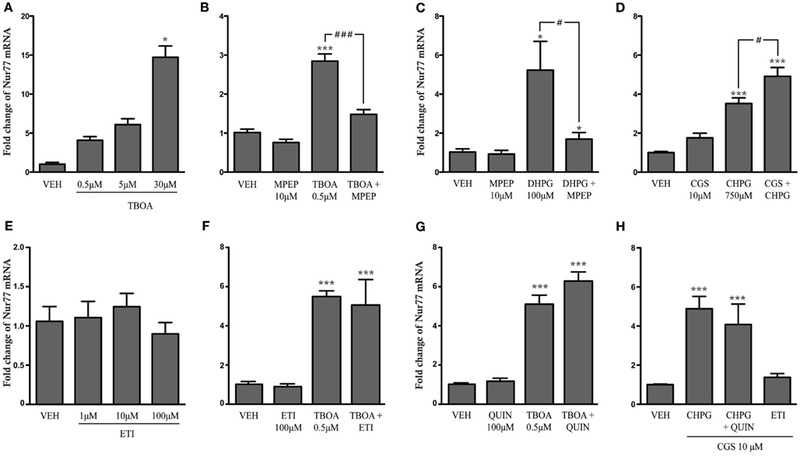 Pre-treatment of organotypic cultures with MPEP, a selective mGlu5 receptor antagonist, significantly reduced the effect of the low dose of TBOA on Nur77 mRNA induction, confirming the important role of mGlu5 receptor in the induction of Nur77 gene transcription by glutamate (Figure 6B). We therefore tested direct activation of mGlu5 receptor in organotypic corticostriatal slices. Exposition to DHPG, a mGlu1/5 agonist, significantly increased Nur77 mRNA expression in the striatum by approximately fivefold (Figure 6C). This effect was selective for mGlu5 receptors since co-administration of MPEP led to a complete blockade of DHPG-induced Nur77 mRNA upregulation (Figure 6C). Additionally, activation of mGlu5 receptor with a more specific agonist (CHPG) also led to a strong increase of Nur77 mRNA levels (Figure 6D). As previously observed in vivo, this effect can be potentiated by a concomitant activation of A2A receptors with CGS21680 (Figure 6D). Direct exposure of corticostriatal organotypic slices to eticlopride or quinpirole (dopamine D2 agonist) alone or in combination with TBOA did not modulate Nur77 mRNA levels (Figures 6E–G). In addition, both D2 agonist and antagonist drugs were not able to modulate mGlu5/A2A agonist-induced striatal Nur77 mRNA levels in organotypic slice preparations (Figure 6H). These results suggest that postsynaptic D2 receptors do not significantly contribute to striatal transcriptional activity in the present experimental conditions. Figure 6. Striatal Nur77 expression is induced by metabotropic glutamate and adenosine receptors in corticostriatal organotypic slice cultures. Nur77 mRNA levels were measured in striatal tissue punches using quantitative real-time RT-PCR from corticostriatal organotypic cultures treated with (A) vehicle (VEH) or increasing doses of TBOA, a glutamate reuptake inhibitor (N = 3; *p < 0.05 vs. VEH group), (B) VEH, TBOA, MPEP (a mGlu5 receptor antagonist) alone, or TBOA + MPEP (N = 5–6; ***p < 0.001 vs. VEH; ###p < 0.001 vs. TBOA group), (C) VEH, MPEP, DHPG (a mGlu1/5 receptor agonist), or MPEP + DHPG (N = 5; *p < 0.05 vs. VEH; #p < 0.05 vs. DHPG group), (D) VEH, CGS21680 (CGS, a adenosine A2A receptor agonist), CHPG (a selective mGlu5 receptor agonist), and CGS + CHPG (N = 5; ***p < 0.001 vs. VEH; # p < 0.05 vs. CHPG group), (E) VEH or increasing doses of the D2 receptor antagonist eticlopride (ETI; N = 6), (F) VEH, quinpirole (QUIN, a dopamine D2 receptor agonist), ETI, TBOA, TBOA + QUIN (N = 6–9; ***p < 0.001 vs. VEH group), (G) VEH, ETI, TBOA, and TBOA + ETI (N = 3; ***p < 0.001 vs. VEH group), and (H) VEH, CHPG + CGS, CHPG + CGS + QUIN, and CGS + ETI (N = 3; ***p < 0.001 vs. VEH). Data are represented as fold change of Nur77 mRNA levels compared to controls (VEH) and normalized with GAPDH house keeping transcript levels. Similar results were obtained using normalization with the HPRT1 housekeeping gene (data not shown). Our results indicate that the modulation of striatal Nur77 mRNA expression by a dopamine D2 antagonist depends on the integrity of the corticostriatal pathway and postsynaptic striatal mGlu5 and A2A receptors activation (see Figure 7 for a proposed model). Thus, presynaptic modulation of glutamate neurotransmission is required in the modulation of striatal transcriptional activity following the administration of a selective D2 receptor antagonist (see Figure 7). Figure 7. Suggested events leading to the modulation of striatal gene transcription by a dopamine D2 antagonist. The figure includes a schematic representation of a striatal medium spiny neuron (MSN) with a glutamatergic terminal coming from the cortex. Data presented herein suggest that the dopamine D2 antagonist blocks presynaptic D2 heteroreceptors (D2S) located on glutamatergic terminals, which control glutamate release (step 1 and 2). This leads to an elevation of glutamate contents in the synapse (step 3), which in turn activate postsynaptic metabotropic mGlu5 and adenosine A2A receptors (step 4). Intracellular signaling events associated with activation of mGlu5 receptors (in addition to adenosine A2A receptors) then lead to the increase of Nur77 gene transcription in MSNs (step 5). The dash line and question mark that link postsynaptic D2L and A2A-mGlu5 receptors illustrate the fact that we were unable to show a contribution of postsynaptic dopamine D2 receptors in the transcriptional effect of mGlu5/A2A receptor agonists in our organotypic slice preparations. It is generally recognized that blockade of striatal postsynaptic D2 receptors is associated with antipsychotic drug activity in the striatum. Thus, the preservation of the effect of the D2 antagonist on Nur77 mRNA expression in the D2L(−/−) mice was somewhat surprising. In the D2L(−/−) mouse, the lack of exon 6, specific for the D2L isoform, results in the conversion of all dopamine D2 receptor transcripts into D2S receptors (Usiello et al., 2000; Lindgren et al., 2003; Centonze et al., 2004b). Our results clearly show that the D2 receptor antagonist could still induce strong activation of Nur77 gene transcription in D2L mutant mice. Therefore, ectopic postsynaptic D2S expression might have fulfilled D2L activity in D2L(−/−) mice. However, this possibility is unlikely because postsynaptic activity of dopamine, such as modulation of DARPP-32 phosphorylation in the striatum, is hampered in this mouse strain (Lindgren et al., 2003). A better understanding of the difference between the two isoforms subcellular expression will be required to better explain this observation. Since D2L receptors are mainly associated with postsynaptic effect of dopamine (Khan et al., 1998b; Usiello et al., 2000; Lindgren et al., 2003), it suggests that a presynaptic event might be needed for eticlopride-induced gene transcription in the striatum. Dopamine D2 receptors can modulate glutamate signaling through both pre- and postsynaptic mechanisms. These receptors can be found on cortical inputs from the corticostriatal pathway (presynaptic D2 heteroreceptors), where they can modulate glutamate release in the striatum (Bamford et al., 2004; Higley and Sabatini, 2010). The present results show that the integrity of the corticostriatal pathway and therefore the presence of presynaptic D2 heteroreceptors are essential for eticlopride-induced striatal gene expression. We demonstrated this by performing extensive lesions of motor cortex by means of intra cortical administration of ibotenic acid. Such lesions have been documented to decrease the role of excitatory amino acid transmission in targeted subcortical areas (Cromwell and Levine, 1996; Garcia et al., 2010). In accordance, the striatal areas altered by the present cortex lesions were restricted to striatal subterritorries (Voorn et al., 2004; Garcia et al., 2010). This suggests that the corticostriatal pathway is of the upmost importance in mediating D2 antagonist regulation of transcription in those striatal areas. These results fall in line with increasing evidence showing the importance of glutamate-dopamine interplay in striatal functions. Interestingly, the present results indicate that ionotropic NMDA receptors are minimally involved in the upregulation of striatal gene transcription by the D2 antagonist, but rather support an important role for the metabotropic mGlu5 receptor subtype. Noteworthy, a number of reports have shown an important interaction between dopamine D2 and mGlu5 receptors along with adenosine A2A receptors. First, an intracellular signaling synergy has been observed between mGlu5 and adenosine A2A receptors in the striatum (Nishi et al., 2003). It has been shown also that co-activation of these receptors can induce c-fos expression in a synergistic manner in the nucleus accumbens and dual blockade of these receptors leads to a synergistic activation of locomotor activity (Ferré et al., 2002; Kachroo et al., 2005). Our data (both in vivo and in vitro) reveal another system in which activation of mGlu5 and A2A produces an additive response. Although previous observations support a direct postsynaptic interaction between D2, A2A, and mGlu5 receptors (Ferré et al., 2002; Kachroo et al., 2005; Bertran-Gonzalez et al., 2009), the present observations suggest that D2-A2A-mGlu5 interaction may also occur indirectly from the activity of a presynaptic D2 receptor (see Figure 7). 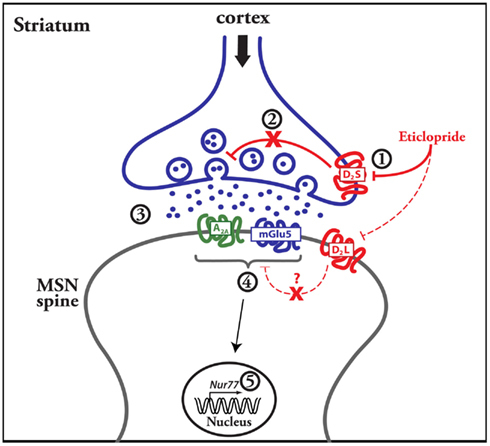 Presynaptic modulation of glutamate neurotransmission by a D2 antagonist is also consistent with previous studies showing that acute and chronic administration of typical antipsychotic drugs, including haloperidol and eticlopride, increase glutamate concentration in the striatum (Bardgett et al., 1993; Yamamoto and Cooperman, 1994). Experiments using organotypic corticostriatal slices confirm the direct modulation of Nur77 expression by mGlu5 and A2A receptors, which is consistent with results obtained in the hippocampus (Lindecke et al., 2006). In acute slice experiments, the glutamate uptake inhibitor TBOA can induce changes in postsynaptic currents (Beurrier et al., 2009) and quinpirole could decrease excitatory postsynaptic potential triggered by TBOA and low frequency cortical stimulation (Yin and Lovinger, 2006). However, we were not able to modulate Nur77 mRNA levels with quinpirole in our organotypic cultures (with or without TBOA). This suggests that corticostriatal terminals might not spontaneously release enough glutamate in our organotypic slice preparations to record a presynaptic effect of the dopamine D2 receptor agonist. In addition, direct D2 receptor activation with quinpirole, or blockade by eticlopride, in organotypic cultures also remained ineffective. This suggests that postsynaptic D2 receptor activity is not associated with the modulation of Nur77 expression in striatal cells. Thus, these results support an indirect effect of D2 receptor drugs on striatal gene expression (Figure 7). The contribution of other presynaptic D2 heteroreceptors, such as those located on striatal cholinergic interneurons (Yan et al., 1997; Tozzi et al., 2011) is unlikely because we showed that the muscarinic antagonist scopolamine administration did not reduce eticlopride-induced Nur77 mRNA expression in the striatum. On the contrary, scopolamine potentiated the effect of eticlopride. This might reflect a prominent activity of this non-selective muscarinic antagonist at m1–2 receptor subtypes located on corticostriatal terminals, which can also modulate glutamate release (Alcantara et al., 2001; Higley et al., 2009). The participation of presynaptic D2 autoreceptors located on dopamine terminals is unlikely as well. Indeed, an elegant study recently showed that mice specifically lacking D2 autoreceptors (autoDrd2KO) display similar haloperidol-induced reduction of horizontal locomotor activity compared to their littermate (Bello et al., 2011), indicating that these receptors are not involved in this D2 antagonist-induced effect. But, transcriptional activity of haloperidol has not been investigated in this transgenic model. Contribution of the dopamine D3 receptor, which is also a potent target of eticlopride, can be discarded as well because haloperidol-induced gene expression in the striatum is not altered in D3 receptor knockout mice (Robertson et al., 2004) and D3 receptor specific antisense oligonucleotides, which significantly reduced D3 receptor binding site density, has been shown to reduce Nur77 expression (Tremblay et al., 1999). CB1 receptors can regulate glutamate release from corticostriatal terminals (Gerdeman and Lovinger, 2001; Kofalvi et al., 2005) and a D2-like-CB1 receptor interplay has been observed in the striatum (Centonze et al., 2004a). Thus, modulation of the present glutamate-dependent effect of eticlopride by CB1 remains a possibility. Although we showed that cannabinoid CB1 receptors antagonist AM251 did not modulate eticlopride-induced striatal Nur77 mRNA expression and that similar AM251 dosages can modulate dopamine-related signaling (Kofalvi et al., 2005; Corbillé et al., 2007), we cannot discard the possibility that a higher dose of AM251 might have produced an effect. In addition, a contribution of other receptor subtypes such as glutamate mGlu2/3 receptors (Garcia et al., 2010), which can also modulate glutamate neurotransmission at corticostriatal terminals, or from thalamostriatal afferences in the modulation of Nur77 expression in the striatal complex cannot be excluded. Additional experiments will be required in order to investigate the exact contribution of these receptor subtypes and striatal afferents to D2 receptor antagonist-induced gene transcription in selective striatal subterritories. In conclusion, the present data indicates that mGlu5-A2A activities mediate D2 receptor antagonist effect on striatal gene expression (Figure 7). Our results provide new evidences that adenosine and glutamate receptors might play an important role in typical antipsychotic drug-mediated effects and uncover an unappreciated role of presynaptic D2 heteroreceptors into the effect of dopamine D2 receptor antagonists. In addition, these results suggest that some striatal intracellular signaling events following D2 antagonist treatments might be attributed to metabotropic glutamate and adenosine receptor activities instead of dopamine D2 receptors. We acknowledge the support of a grant from the Canadian Institutes for Health Research (CIHR). Jérôme Maheux holds a Michael Smith honorific fellowship for research on schizophrenia from the CIHR. Alcantara, A. A., Mrzljak, L., Jakab, R. L., Levey, A. I., Hersch, S. M., and Goldman-Rakic, P. S. (2001). Muscarinic m1 and m2 receptor proteins in local circuit and projection neurons of the primate striatum: anatomical evidence for cholinergic modulation of glutamatergic prefronto-striatal pathways. J. Comp. Neurol. 434, 445–460. Bäckman, C., and Morales, M. (2002). Acute methamphetamine administration upregulates NGFI-B mRNA expression in the striatum: co-localization with C-FOS immunoreactivity. Synapse 44, 158–165. Bamford, N. S., Zhang, H., Schmitz, Y., Wu, N.-P., Cepeda, C., Levine, M. S., Schmauss, C., Zakharenko, S. S., Zablow, L., and Sulzer, D. (2004). Heterosynaptic dopamine neurotransmission selects sets of corticostriatal terminals. Neuron 42, 653–663. Bardgett, M. E., Wrona, C. T., Newcomer, J. W., and Csernansky, J. G. (1993). Subcortical excitatory amino acid levels after acute and subchronic administration of typical and atypical neuroleptics. Eur. J. Pharmacol. 230, 245–250. Beaudry, G., Langlois, M.-C., Weppe, I., Rouillard, C., and Lévesque, D. (2000). Contrasting patterns and cellular specificity of transcriptional regulation of the nuclear receptor nerve growth factor-inducible B by haloperidol and clozapine in the rat forebrain. J. Neurochem. 75, 1694–1702. Bello, E. P., Mateo, Y., Gelman, D. M., Noain, D., Shin, J. H., Low, M. J., Alvarez, V. A., Lovinger, D. M., and Rubinstein, M. (2011). Cocaine supersensitivity and enhanced motivation for reward in mice lacking dopamine D2 autoreceptors. Nat. Neurosci. 14, 1033–1038. Bertran-Gonzalez, J., Hakansson, K., Borgkvist, A., Irinopoulou, T., Brami-Cherrier, K., Usiello, A., Greengard, P., Hervé, D., Girault, J. A., Valjent, E., and Fisone, G. (2009). Histone H3 phosphorylation is under the opposite tonic control of dopamine D2 and adenosine A2A receptors in striatopallidal neurons. Neuropsychopharmacology 34, 1710–1720. Beurrier, C., Bonvento, G., Kerkerian-Le Goff, L., and Gubellini, P. (2009). Role of glutamate transporters in corticostriatal synaptic transmission. Neuroscience 158, 1608–1615. Bhardwaj, S. K., Beaudry, G., Quirion, R., Lévesque, D., and Srivastava, L. K. (2003). Neonatal ventral hippocampus lesion leads to reductions in nerve growth factor inducible-B mRNA in the prefrontal cortex and increased amphetamine response in the nucleus accumbens and dorsal striatum. Neuroscience 122, 669–676. Bourhis, E., Maheux, J., Rouillard, C., and Lévesque, D. (2008). Extracellular signal-regulated kinases (ERK) and protein kinase C (PKC) activities are involved in the modulation of Nur77 and Nor-1 expression by dopaminergic drugs. J. Neurochem. 106, 875–888. Centonze, D., Battista, N., Rossi, S., Mercuri, N. B., Finazzi-Agro, A., Bernardi, G., Calabresi, P., and Maccarrone, M. (2004a). A critical interaction between dopamine D2 receptors and endocannabinoids mediates the effects of cocaine on striatal GABAergic transmission. Neuropsychopharmacology 29, 1488–1497. Centonze, D., Gubellini, P., Usiello, A., Rossi, S., Tscherter, A., Bracci, E., Erbs, E., Tognazzi, N., Bernardi, G., Pisani, A., Calabresi, P., and Borrelli, E. (2004b). Differential contribution of dopamine D2S and D2L receptors in the modulation of glutamate and GABA transmission in the striatum. Neuroscience 129, 157–166. Cepeda, C., Hurst, R. S., Altemus, K. L., Flores-Hernandez, J., Calvert, C. R., Jokel, E. S., Grandy, D. K., Low, M. J., Rubinstein, M., Ariano, M. A., and Levine, M. S. (2001). Facilitated glutamatergic transmission in the striatum of D2 dopamine receptor-deficient mice. J. Neurophysiol. 85, 659–670. Chartoff, E. H., Ward, R. P., and Dorsa, D. M. (1999). Role of adenosine and N-methyl-D-aspartate receptors in mediating haloperidol-induced gene expression and catalepsy. J. Pharmacol. Exp. Ther. 291, 531–537. Clements, R. L., and Greenshaw, A. J. (2005). Facilitation of brain stimulation reward by MK-801 (dizocilpine) may be independent of D2-like dopamine receptor stimulation in rats. Psychopharmacology (Berl.) 182, 65–74. Conn, P. J., Lindsley, C. W., and Jones, C. K. (2009). Activation of metabotropic glutamate receptors as a novel approach for the treatment of schizophrenia. Trends Pharmacol. Sci. 30, 25–31. Corbillé, A. G., Valjent, E., Marsicano, G., Ledent, C., Lutz, B., Hervé, D., and Girault, J. A. (2007). Role of cannabinoid type 1 receptors in locomotor activity and striatal signaling in response to psychostimulants. J. Neurosci. 27, 6937–6947. Cromwell, H. C., and Levine, M. S. (1996). Neocortical damage alters synaptic responses of neostriatal neurons in vitro. Neuroscience 75, 361–372. Ethier, I., Beaudry, G., St-Hilaire, M., Milbrandt, J., Rouillard, C., and Lévesque, D. (2004a). The transcription factor NGFI-B (Nur77) and retinoids play a critical role in acute neuroleptic-induced extrapyramidal effect and striatal neuropeptide gene expression. Neuropsychopharmacology 29, 335–346. Ethier, I., Kagechika, H., Shudo, K., Rouillard, C., and Lévesque, D. (2004b). Docosahexaenoic acid reduces haloperidol-induced dyskinesias in mice: involvement of Nur77 and retinoid receptors. Biol. Psychiatry 56, 522–526. Ferré, S., Karcz-Kubicha, M., Hope, B. T., Popoli, P., Burgueno, J., Gutierrez, M. A., Casado, V., Fuxe, K., Goldberg, S. R., Lluis, C., Franco, R., and Ciruela, F. (2002). Synergistic interaction between adenosine A2A and glutamate mGlu5 receptors: implications for striatal neuronal function. Proc. Natl. Acad. Sci. U.S.A. 99, 11940–11945. Garcia, B. G., Neely, M. D., and Deutch, A. Y. (2010). Cortical regulation of striatal medium spiny neuron dendritic remodeling in parkinsonism: modulation of glutamate release reverses dopamine depletion-induced dendritic spine loss. Cereb. Cortex 20, 2423–2432. Gerdeman, G., and Lovinger, D. M. (2001). CB1 cannabinoid receptor inhibits synaptic release of glutamate in rat dorsolateral striatum. J. Neurophysiol. 85, 468–471. Giros, B., Sokoloff, P., Martres, M.-P., Riou, J.-F., Emorine, L. J., and Schwartz, J.-C. (1989). Alternative splicing directs the expression of two D2 dopamine receptor isoforms. Nature 342, 923–926. Guo, N., Robertson, G. S., and Fibiger, H. C. (1992). Scopolamine attenuates haloperidol-induced c-fos expression in the striatum. Brain Res. 588, 164–167. Hattori, Y., Watanabe, M., Iwabe, T., Tanaka, E., Nishi, M., Aoyama, J., Satoda, T., Uchida, T., and Tanne, K. (2004). Administration of MK-801 decreases c-Fos expression in the trigeminal sensory nuclear complex but increases it in the midbrain during experimental movement of rat molars. Brain Res. 1021, 183–191. Herrera, D. G., and Robertson, H. A. (1996). Activation of c-fos in the brain. Prog. Neurobiol. 50, 83–107. Higley, M. J., and Sabatini, B. L. (2010). Competitive regulation of synaptic Ca2+ influx by D2 dopamine and A2A adenosine receptors. Nat. Neurosci. 13, 958–966. Higley, M. J., Soler-Llavina, G. J., and Sabatini, B. L. (2009). Cholinergic modulation of multivesicular release regulates striatal synaptic potency and integration. Nat. Neurosci. 12, 1121–1128. Kachroo, A., Orlando, L. R., Grandy, D. K., Chen, J. F., Young, A. B., and Schwarzschild, M. A. (2005). Interactions between metabotropic glutamate 5 and adenosine A2A receptors in normal and parkinsonian mice. J. Neurosci. 25, 10414–10419. Keefe, K. A., and Adams, A. C. (1998). Differential effects of N-methyl-D-aspartate receptor blockade on eticlopride-induced immediate early gene expression in the medial and lateral striatum. J. Pharmacol. Exp. Ther. 287, 1076–1083. Khan, Z. U., Gutierrez, A., Martin, R., Penafiel, A., Rivera, A., and De La Calle, A. (1998a). Differential regional and cellular distribution of dopamine D2-like receptors: an immunocytochemical study of subtype-specific antibodies in rat and human brain. J. Comp. Neurol. 402, 353–371. Khan, Z. U., Mrzljak, L., Gutierrez, A., De La Calle, A., and Goldman-Rakic, P. S. (1998b). Prominence of the dopamine D2 short isoform in dopaminergic pathways. Proc. Natl. Acad. Sci. U.S.A. 95, 7731–7736. Kofalvi, A., Rodrigues, R. J., Ledent, C., Mackie, K., Vizi, E. S., Cunha, R. A., and Sperlagh, B. (2005). Involvement of cannabinoid receptors in the regulation of neurotransmitter release in the rodent striatum: a combined immunochemical and pharmacological analysis. J. Neurosci. 25, 2874–2884. Lara, D. R., Dall’igna, O. P., Ghisolfi, E. S., and Brunstein, M. G. (2006). Involvement of adenosine in the neurobiology of schizophrenia and its therapeutic implications. Prog. Neuropsychopharmacol. Biol. Psychiatry 30, 617–629. Lévesque, D., and Rouillard, C. (2007). Nur77 and retinoid X receptors: crucial factors in dopamine-related neuroadaptation. Trends Neurosci. 30, 22–30. Lindecke, A., Korte, M., Zagrebelsky, M., Horejschi, V., Elvers, M., Widera, D., Prullage, M., Pfeiffer, J., Kaltschmidt, B., and Kaltschmidt, C. (2006). Long-term depression activates transcription of immediate early transcription factor genes: involvement of serum response factor/Elk-1. Eur. J. Neurosci. 24, 555–563. Lindgren, N., Usiello, A., Goiny, M., Haycock, J., Erbs, E., Greengard, P., Hökfelt, T., Borrelli, E., and Fisone, G. (2003). Distinct roles of dopamine D2L and D2S receptor isoforms in the regulation of protein phosphorylation at presynaptic and postsynaptic sites. Proc. Natl. Acad. Sci. U.S.A. 100, 4305–4309. Maheux, J., Ethier, I., Rouillard, C., and Lévesque, D. (2005). 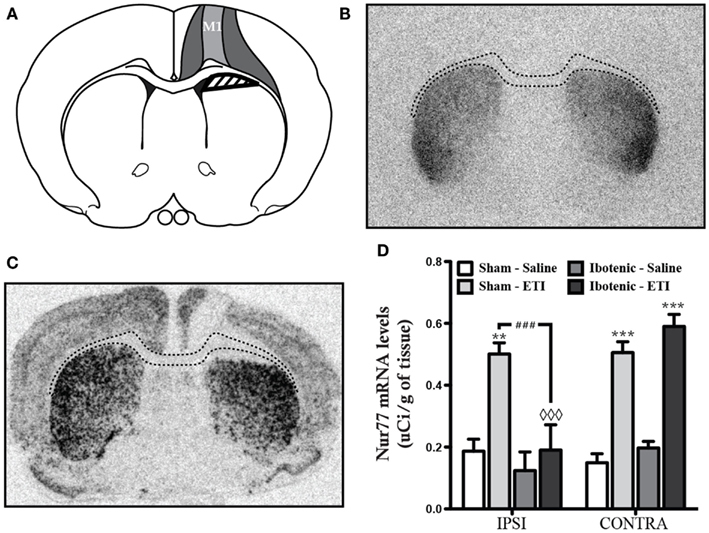 Induction patterns of transcription factors of the Nur family (Nurr1, Nur77 and Nor-1) by typical and atypical antipsychotics in the mouse brain: implication for their mechanism of action. J. Pharmacol. Exp. Ther. 313, 460–473. Martelle, J. L., and Nader, M. A. (2008). A review of the discovery, pharmacological characterization, and behavioral effects of the dopamine D2-like receptor antagonist eticlopride. CNS Neurosci. Ther. 14, 248–262. Martres, M.-P., Bouthenet, M.-L., Sokoloff, P., and Schwartz, J.-C. (1985). Widespread distribution of brain dopamine receptors evidenced with [125I]iodosulpride, a highly selective ligand. Science 228, 752–755. Maura, G., Giardi, A., and Raiteri, M. (1988). Release-regulating D-2 dopamine receptors are located on striatal glutamatergic nerve terminals. J. Pharmacol. Exp. Ther. 247, 680–684. Miyamoto, S., Duncan, G. E., Marx, C. E., and Lieberman, J. A. (2005). Treatments for schizophrenia: a critical review of pharmacology and mechanisms of action of antipsychotic drugs. Mol. Psychiatry 10, 79–104. Nishi, A., Liu, F., Matsuyama, S., Hamada, M., Higashi, H., Nairn, A. C., and Greengard, P. (2003). Metabotropic mGlu5 receptors regulate adenosine A2A receptor signaling. Proc. Natl. Acad. Sci. U.S.A. 100, 1322–1327. Ossowska, K., Konieczny, J., Wolfarth, S., Wieronska, J., and Pilc, A. (2001). Blockade of the metabotropic glutamate receptor subtype 5 (mGluR5) produces antiparkinsonian-like effects in rats. Neuropharmacology 41, 413–420. Parelkar, N. K., and Wang, J. Q. (2004). mGluR5-dependent increases in immediate early gene expression in the rat striatum following acute administration of amphetamine. Brain Res. Mol. Brain Res. 122, 151–157. Pinna, A., Wardas, J., Cozzolino, A., and Morelli, M. (1999). Involvement of adenosine A2A receptors in the induction of c-fos expression by clozapine and haloperidol. Neuropsychopharmacology 20, 44–51. Pollack, A. E., and Fink, J. S. (1995). Adenosine antagonists potentiate D2 dopamine-dependent activation of Fos in the striatopallidal pathway. Neuroscience 68, 721–728. Pozzi, L., Hakansson, K., Usiello, A., Borgkvist, A., Lindskog, M., Greengard, P., and Fisone, G. (2003). Opposite regulation by typical and atypical anti-psychotics of ERK1/2, CREB and Elk-1 phosphorylation in mouse dorsal striatum. J. Neurochem. 86, 451–459. Robertson, G. S., Lee, C. J., Sridhar, K., Nakabeppu, Y., Cheng, M., Wang, Y.-M., and Caron, M. G. (2004). Clozapine-, but not haloperidol-, induced increases in Δ FosB-like immunoreactivity are completely blocked in the striatum of mice lacking D3 dopamine receptors. Eur. J. Neurosci. 20, 3189–3194. Rouillard, C., Chiodo, L. A., and Freeman, A. S. (1990). The effects of the phencyclidine analogs BTCP and TCP on nigrostriatal dopamine neuronal activity. Eur. J. Pharmacol. 182, 227–235. Rubino, T., Sala, M., Vigano, D., Braida, D., Castiglioni, C., Limonta, V., Guidali, C., Realini, N., and Parolaro, D. (2007). Cellular mechanisms underlying the anxiolytic effect of low doses of peripheral Δ 9-tetrahydrocannabinol in rats. Neuropsychopharmacology 32, 2036–2045. Schwarcz, R., Creese, I., Coyle, J. T., and Snyder, S. H. (1978). Dopamine receptors localised on cerebral cortical afferents to rat corpus striatum. Nature 271, 766–768. Stahl, K., Skare, O., and Torp, R. (2009). Organotypic cultures as a model of Parkinson’s disease. A twist to an old model. ScientificWorldJournal 9, 811–821. St-Hilaire, M., Landry, É., Lévesque, D., and Rouillard, C. (2003). Denervation and repeated L-DOPA induce a coordinate expression of the transcription factor NGFI-B in striatal projection pathways in hemi-Parkinsonian rats. Neurobiol. Dis. 14, 98–109. Tozzi, A., De Iure, A., Di Filippo, M., Tantucci, M., Costa, C., Borsini, F., Ghiglieri, V., Giampa, C., Fusco, F. R., Picconi, B., and Calabresi, P. (2011). The distinct role of medium spiny neurons and cholinergic interneurons in the D2/A2A receptor interaction in the striatum: implications for Parkinson’s disease. J. Neurosci. 31, 1850–1862. Tremblay, M., Rouillard, C., and Lévesque, D. (1999). Dopamine D3 receptor antisense administration reduces basal c-fos and NGFI-B mRNA levels in the rat forebrain. Synapse 32, 51–57. Usiello, A., Baik, J. H., Rougé-Pont, F., Picetti, R., Dierich, A., Lemeur, M., Piazza, P. V., and Borrelli, E. (2000). Distinct functions of the two isoforms of dopamine D2 receptors. Nature 408, 199–203. Voorn, P., Vanderschuren, L. J. M. J., Groenewegen, H. J., Robbins, T. W., and Pennartz, C. M. A. (2004). Putting a spin on the dorsal-ventral divide of the striatum. Trends Neurosci. 27, 468–474. Wang, H., and Pickel, V. M. (2002). Dopamine D2 receptors are present in prefrontal cortical afferents and their targets in patches of the rat caudate-putamen nucleus. J. Comp. Neurol. 442, 392–404. Wang, J. Q., and McGinty, J. F. (1996). Scopolamine augments c-fos and Zif/268 messenger RNA expression induced by the full D1 dopamine receptor agonist SKF-82958 in the intact rat striatum. Neuroscience 72, 601–616. Werme, M., Ringholm, A., Olson, L., and Brené, S. (2000). Differential patterns of induction of NGFI-B, Nor1 and c-fos mRNAs in striatal subregions by haloperidol and clozapine. Brain Res. 863, 112–119. Xi, Z. X., Gilbert, J. G., Peng, X. Q., Pak, A. C., Li, X., and Gardner, E. L. (2006). Cannabinoid CB1 receptor antagonist AM251 inhibits cocaine-primed relapse in rats: role of glutamate in the nucleus accumbens. J. Neurosci. 26, 8531–8536. Yamamoto, B. K., and Cooperman, M. A. (1994). Differential effects of chronic antipsychotic drug treatment on extracellular glutamate and dopamine concentrations. J. Neurosci. 14, 4159–4166. Yan, Z., Song, W.-J., and Surmeier, J. (1997). D2 dopamine receptors reduce N-type Ca2+ currents in rat neostriatal cholinergic interneurons through a membrane-delimited, protein-kinase-C-insensitive pathway. J. Neurophysiol. 77, 1003–1015. Copyright: © 2012 Maheux, St-Hilaire, Voyer, Tirotta, Borrelli, Rouillard, Rompré and Lévesque. This is an open-access article distributed under the terms of the Creative Commons Attribution License, which permits use, distribution and reproduction in other forums, provided the original authors and source are credited and subject to any copyright notices concerning any third-party graphics etc.